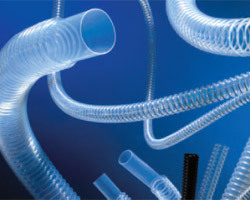 Chemfluor® CT-Flex™ Corrugated FEP or PFA tubing shapes and flexes easily and will conform to tortuous paths. It features a bend radius of virtually zero, can be extended or compressed without affecting the inner diameter, and resists chemicals, elevated temperatures, cut-through and strain. CT-Flex is made from FEP, has read-through transparency and is FDA-approved under regulation 21 CFR 17.1550. Chemfluor® and CT-Flex™ are trademarks of Saint-Gobain Performance Plastics.